Matt and Amy purchased their 34 acre farm in May, 1990. Nestled between rolling hills and farms just outside of Portland, Oregon, the property consisted of a beat up old farmhouse, a broken down barn and an overgrown peach orchard. Amy would have been comfortable with a beautiful home they had found in the city, but Matt was drawn to the rural life. "He had a dream" — a vision of what this property could be, their ideal home. While Amy managed their growing family, Matt set out to make their dream come true. He envisioned a working farm, but also a magical place for his children. During the early years he built a Tom-Sawyer-like adventure land with a huge pirate ship, a three-story tree fort and a marvelous Western Town (complete with underground tunnels)! Later he added a soccer field, in ground pool, and more imaginative play structures. He continues adding each and every year. Today, Roloff Farm is a successful agricultural business, event center, and major tourist destination during pumpkin season. Hi Friends. You probably wonder why I have an insert about the Roloff family and their farm. Keep reading, I'll get to that. In the meantime, I like the name of Indiana's Triple A Magazine "Home and Away", so I've decided to post some Home and Away pics for you to enjoy this morning. Isn't this cool? This is home. 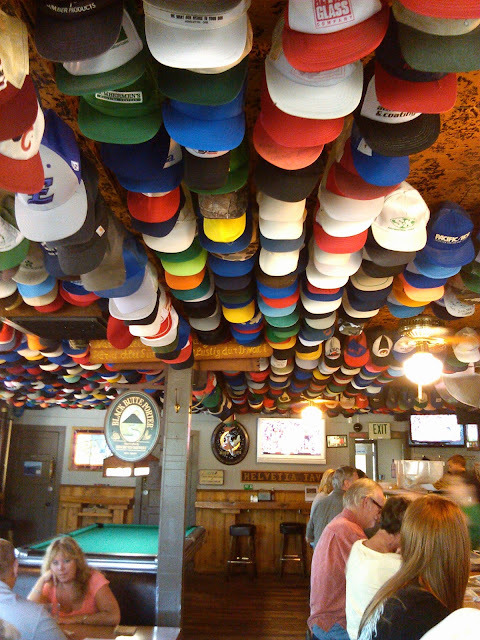 Helvetia Tavern in Oregon, our home state. My husband's grandparents owned a farm near here in Helvetia, and he spent many summers on it. **Interesting tidbit (The part you are waiting for): The farm is now the setting of the "Little People, Big World" reality show. It is owned by the Roloff family. We have visited them, and been inside the barn Grandpa built. Matt Roloff has written a book about his dreams for the farm (Against All Odds), and since I just learned of this I think I'll have to get the book and read it. So, that is home. Part of it anyway. For now our home is our son and daughter-in-law's basement in Indiana. We are just a short ride to the lot on which we are building our Southern Cottage Girl home. I guess you could call that the "away" because we are away from home creating a new home that we are going to love! Check out my page; "new building updates" for construction photos. I hope you'll come along with us on this journey; Our own "Home and Away" blog posts, updated daily. Thanks for stopping by. We love you all! Have a great day. Ever ponder who lived there before.